Exploring how messages about the First and Second World Wars are conveyed through print culture, spiritualism, material culture, and teaching. Speakers: David Nash, Vincent Trott, Sarah Wearne, Susannah Wright. Jointly organised with Oxford Brookes University. 2:30pm, Harold Lee Room (Pembroke College, Oxford). Free and open to all. 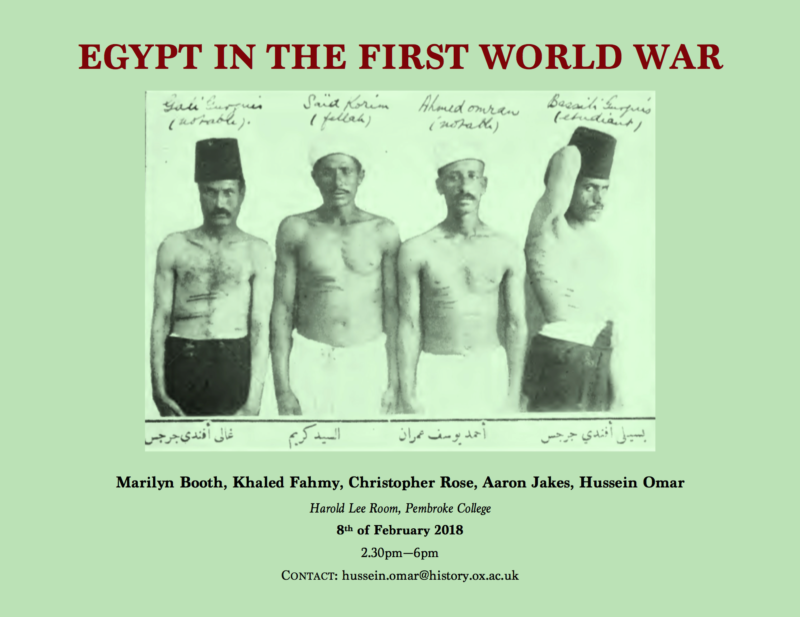 Non-Oxford attendees please RSVP to organiser Dr. Hussein Omar at hussein.omar@history.ox.ac.uk. Please note different start time and location. Week 5 (15 Feb) – No seminar. PLEASE NOTE: THIS SEMINAR HAS BEEN CANCELLED DUE TO THE UCU STRIKE. Week 7 (1 Mar) – Symposium – Constructing Messages of War. Joint event with Oxford Brookes, co-organised by Dr. Jane Potter and Dr. Susannah Wright. Exploring how messages about war are conveyed through print culture, material culture, and teaching. 2-5pm, The Green Room, Headington Hill Hall, Oxford Brookes University. Free, but registration necessary for all attendees. Please contact glgwevents@history.ox.ac.uk to register. Please note different start time and location. PLEASE NOTE: THIS SYMPOSIUM HAS BEEN POSTPONED DUE TO THE ADVERSE WEATHER CONDITIONS. 28 November, 16.00-17.30 – Professor John Horne (Trinity College Dublin & University of Oxford), War as Revolution, 1914-1923, valedictory lecture as finale of Professor Horne’s Leverhulme Visiting Professorship at the University of Oxford. Lecture Theatre, History Faculty, followed by drinks reception from 17.30-19.00, Joan Thirsk Common Room, History Faculty. The drinks reception will be combined with a book launch for Professor Toby Garfitt‘s edited volume Writing the Great War. He will give a short talk about the book at 18.00. The drinks reception is generously supported by the Faculty of History and Peter Lang Limited. Week 8 (30 Nov-1 Dec) – Closed Workshop – Anglo/Belgian Great War Research Exchange, Pembroke College, followed by tour of Oxford on the Friday afternoon by First World War historian Dr Malcolm Graham. The workshop is generously supported by Pembroke College, St John’s College and the Faculty of History.